When you’re dealing with water-damaged carpeting and rugs, your cleaning options depend largely upon the source of the flooding. If the unwanted water was just the result of relatively clean basement seepage or perhaps lawn sprinkler spillage into your sub-basement, then you’re fairly lucky and cleaning is an easy choice. However if your carpets and rugs have been doused with sewage-contaminated floodwater for example, then your choices are limited to discarding it for health and safety reasons or hiring a professional flood cleanup company like Water Damage. When in doubt about the flooding source, it’s safest to assume the water is not clean and the carpet may contain dangerous substances or organisms. 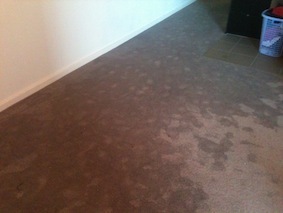 Our water removal experts at Water Damage use industrial-strength carpet cleaning methods and tools to guarantee that potentially damaging spoilage is safely removed from all types of flooded carpets. Even throw rugs can usually be saved! Our full complement of flooded carpet cleaning services at Water Damage includes deodorization and disinfecting, re-stretching or repair of wet carpet when appropriate, as well as fabric protection and waterproofing to prevent future damage. Depending on how your carpeting is installed, we may be able to remove it in order to have it cleaned and then reinstall it later. Vacuum the carpet after it is thoroughly dry. If you notice a musty smell you can sprinkle a bit of baking soda over the carpet. Gently work it in with a sponge mop and leave the treatment on overnight. Vacuum the baking soda out thoroughly the following day.